TUCSON, Ariz. — His jersey soaked from a water cooler bath, Cal Stevenson dutifully completed his on-field interview with the Pac-12 Network, then answered questions from a group of print reporters. When he finished, he started to walk away from the Arizona dugout to greet some fans, but Jared Oliva called him back. “Hey, Ken Griffey. Is that your helmet?” Oliva asked him. Stevenson could be forgiven for misplacing his helmet, which he had chucked deep into the Arizona night minutes earlier, just before he crossed home plate and was swallowed up by a jumping, screaming mass of Wildcats. 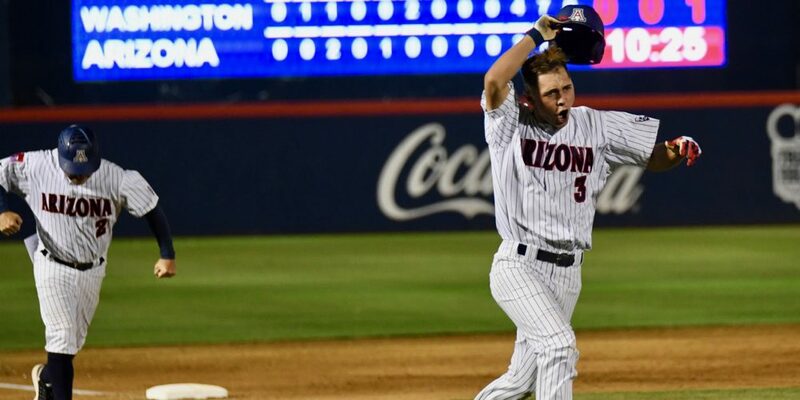 A moment before that, Stevenson had crushed a first-pitch Leo Nieurenberg fastball even deeper into the night, over the right-field wall for a walk-off two-run homer, turning a 4-3 ninth-inning deficit into an electrifying 5-4 Arizona win against Washington. It was one of those no-doubters right off the bat, and Stevenson reacted by flinging his bat on his way to first base, an expression of the cathartic, emotional nature of the moment. Oliva, who watched the home run from the on-deck circle, had a different take.